Glue guns have caused a revolutionary effect in not just the works of craftsmen and repairmen, but also for general people at home and DIY enthusiasts. From adjoining rubbers and metal to acting as the solder in electronic projects, from attaching fabrics to even binding books, joining ornaments, the hot glue guns are immensely useful at present time. The ease of attaching things using these and also their affordability are the main reasons of their huge popularity in today’s world. With so many types of high quality glue guns being manufactured nowadays, it’s pretty difficult to choose the perfect one for yourself. Well, to help you decide faster, below we present you the best glue guns in the world right now, with all their features! What is a Glue Gun? How To Use A Hot Glue Gun? The CCbetter mini hot melt glue gun heats up really quickly, in just around 1-3 minutes. It’s small and versatile, and it can be used comfortably in small jobs, like on fabrics and DIY crafts. Safety is a big part of all glue guns, and it’s not a different case for this gun. It has a number of safety properties, so that you can use it without danger. It has a strong and bendable support, easing its use, along with a power switch and the common-in-all LED light mode. 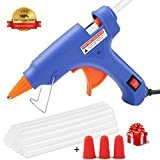 This mini hot glue gun has a trigger propulsion device inside it, which prevents overflow or underflow of the glue, and also helps to keep the flow of the glue smooth. This saves much more glue sticks. The trigger of the glue gun is also very comfortable to use. It squeezes easily when pushed, and your fingers won’t feel coarse after using it for a long time. The casing is made of high-quality plastic making the glue gun very tough and robust. It has a shielded heat-resistant nozzle, which isn’t affected even at very high temperatures, like 250 degrees Celsius. Can last for a very long time. Many safety features, including power. It only works to its full potential in small tasks. Movement-sensitive; so glue can easily spill over anything. Are you a DIY fanatic? Well, good news! Cobiz Hot Glue gun is the one of those heavy duty glue guns for DIY projects. High-quality plastic has been used to create this awesome piece of machinery. This helps the glue gun to keep up with high temperatures and pressure with ease. It has a special two-power option; you can interchange between 60W and 100W. 60W can be used when you’re mostly doing handicrafts, while 100W can be used for a stronger and stickier glue, to attach things made of wood. The glue gun also heats up in 1-3 minutes, faster than other general glue guns. Along with the glue gun, you’ll also get ten high-quality hot glue-sticks, which have the assurance of being smooth and odorless. Apart from that, there are also fuses inside the glue guns, which help to prevent fire if the glue gun overheats. The trigger of the gun can also be controlled easily; the sticks move forward automatically, so you don’t have to use your other hand to push the sticks outwards. The glue gun has a very secure stand, which doesn’t fall over easily. Easier control over the trigger. Sometimes, the glue doesn’t easily come out. This is one of those glue guns which have attracted a lot of customers, and it didn’t fail to impress! It warms up pretty fast, in less than 3 minutes! But, to avoid danger, it also has a smart temperature control, which keeps the increase in temperature in check, and not to an extremely high level. This glue gun has a safety fuse inside, which avoids overheating, and also a switch to on or off so that you don't have to unplug it frequently. This hot glue gun is quite energy efficient. 20W is enough for the glue gun to work properly. On top of that, it comes with 50 of the best hot glue gun sticks! The specialty of this glue gun is that it has a vast range of features, almost all the features of the general hot glue guns, but at a much lower price. Buyers labeled it as one of the best cheap hot glue guns. The glue gun stand doesn’t work properly sometimes. The plastic could be of better quality. RAGNAROS is a pretty popular brand among people who love arts and crafts; their glue gun is just another example as to why they’re so well-known. It’s a high-quality best hot glue gun, with endless attributes. It has an extraordinary copper nozzle, with a cover which protects from high temperatures and prevents wearing. There’s an inbuilt trigger impulsion device, which controls glue flow and prevents the back flow of glue; this helps in storing glue sticks for a longer period of time. The glue flows very smoothly, and comes out pretty easily. That is why we found this gun to be the most suitable for upholstery. 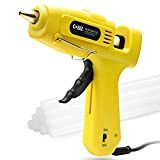 Akin to the previous glue guns, it preheats in about only 3-5 minutes, and has a smart temperature control, which keeps the temperature up to a certain level. 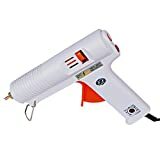 The RAGNAROS hot melt glue gun is one of the safest glue guns to use; along with all the fuses and LED displays, it has an anti-burning casing, with a heat-resistant handle! The glue gun is also environment-friendly and has UL certification. Not available in wireless form. Price might seem a bit high to people with tight budget. This mini hot glue gun is made of very-good quality plastic, and is very long-lasting. This is a great glue gun for using on fabrics, repairing, and also crafting. The glue gun warms up in 3-5 minutes, hence it’s not time-consuming. This is really helpful as, if you’re in a hurry to finish some work using the glue gun, the less pre-heating time can actually step up your work! The glue gun also has effective safety features, like LED light mode. The LED light flashes in times of insecurity, like when the temperature becomes too high. This will prevent you from any kind of blister or damage and will also protect the gun itself. The glue gun comes with 25 pieces of best glue gun sticks, which works as a very solid bonding agent. It is manufactured with the best kinds of plastics, which makes the glue gun very long-lasting and high-performance delivering. It’s a mini hot glue gun, so it’s comfy and handy. Even though it can’t be used for big tasks, this glue gun is perfect for your DIY crafts and also repairing. The Blusmart company are so sure about the quality of their product, that they gave a 100% satisfaction guarantee or cashback! The glue comes out slowly sometimes. The glue gun can only be used for minor work. The WEIO hot glue gun has gained a lot of popularity as child safe glue gun recently, because of a small addition in features that makes it stand out. It has special safety features, like smart temperature control, etc. But, with that, WEIO also provides 3 silicone finger caps, which covers the fingers, making this a kid safe glue gun. This makes the glue gun idyllic for household purposes, as well as industrial purposes. It opposes a high rise in temperature, and also has a built-in device, which makes the flow of glue smoother. This glue gun uses less energy very efficiently to get ready; this is an amazing feature. It saves a lot of energy, which saves your electricity costs but the quality of the glue gun is still awesome! There’s an on/off switch on the glue gun; rather than getting started directly when the main switch is turned on, we can decide when to turn the glue gun with the switches on its own body. This makes the use of this hot glue gun more expedient. 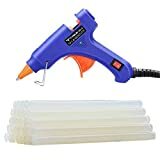 25 pieces of glue sticks come along with this cheap glue gun. It is normal for one or two glue guns to be inoperative out of the thousands manufactured each day, isn’t it(after all, these are made by us humans!)?. So, if you’re one of those unlucky people to receive one of those bad glue guns, don’t get upset! Because WEIO assures quality performance; and if you are unsatisfied with your glue gun, you get a free replacement or they’ll help you in every way they can until you’re happy with your product. This applies for the first 18 months, but that’s so cool, isn’t it? Numerous Safety properties, like finger caps. On rare occasions, the glue gun can get jammed. BSTPOWER glue gun professional is a unique kind of glue gun, which is a bit different from general glue guns. It has a changeable temperature control. It functions properly in a wide range of temperatures, enabling it to be useful in both hot and cold objects. It also stops overheating, using a ceramic PTC thermistor; there are also cooling holes and heat insulation devices which conserves more energy. This hot glue gun has an interchangeable nozzle, so you can choose the most suitable nozzle for a particular purpose. It also has an anti-drip fitted inside, obstructs the leakage of glue and also allows the glue to flow easily. The glue gun is lightweight and comfortable to work with, and has a separable stand which keeps the gun steady and safe. Functional over a wide range of temperatures. You might need to use a screwdriver to change the temperature control. Glue gun is like an electric machine, with the shape of a gun, which produces melted glue. The gun literally has a trigger, and when it’s pulled, the glue comes out in a uniform manner. This glue acts as an adhesive, and efficiently sticks objects together. That’s why, it’s also sometimes referred to as Adhesive Glue Guns. There are various kinds of glue guns for fabrics, wooden work and also repairing. Glue gun crafts are a treat to the eyes; they can be used in beautifully designing a flower vase, or even making a Harry Potter wand! It is one of the most favorite and essential belonging of any DIY enthusiast. Glue gun sticks are the main part of the glue gun. These are adhesives, but in solid form. Different kinds of glue sticks with different features, and various prices can be found. Basically, the glue stick is put inside the glue gun. Once the glue gun is turned on, the glue stick gets heated and melts, turning into a liquid adhesive. The liquid adhesive comes out through the nozzle tip, to the outside. The glue gun nozzles come in distinct shapes. The adhesive comes out of the glue gun through the tip of the nozzle, and different shapes mean that we can choose the way we want the glue to be disbursed. There are different designs of the trigger which u can choose from, depending on your purpose and comfort. There are some which have just one trigger, but this can cause pain in your finger if you overuse it; in that case, there are guns with multiple triggers too. There are also other varieties of triggers, for example, you have to just pull the trigger for the glue to come out; and there are also a bit harder-to-use types, where you have to apply pressure with your fingers. You should make sure the glue gun you will be purchasing will be long-lasting, and won’t slacken later on. The performance should be up-to the mark for a long period. It’d be a total bust if you purchased a glue gun, and it impaired after a few months. Different glue guns require different kinds of power, depending on their type and the level of work they are used for. 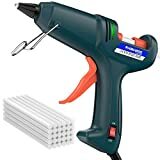 Some glue guns need just around 25W, so that the solid glue melts quickly; others may need up-to 80W or so, especially those used in high-level industrial work. Choosing the right power is important, because if you use excess power compared to what you actually need, you’ll just be wasting energy, and your electricity costs are also going to rise. The cord-length is a pretty important factor. Basically, it depends on the place you’ll be working, and the kind of stuff you’ll be working on. If you’re working on furniture, it’d be cumbersome to move them around, isn’t it? So, you could use lengthy cords and easily take the glue gun to the furniture instead. On the other hand, if you’re working on small objects at home, it’d be a much better choice to use a glue gun with a short cord, or a cordless glue gun as long wires can get messed up. You should make sure the Glue Gun Stand you decide to buy is well-built, and also provides protection. It’s also known as a Glue Gun Holder. 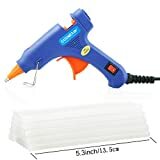 Generally, the brands that provide glue gun kits with their glue gun, along with the glue sticks they also give the glue gun stand. If you just buy a glue gun without the kit, there’s nothing to worry about anyhow! You can make your own glue gun stand using the glue gun you bought. There are numerous tutorials in YouTube which you can look up, and construct a glue gun holder of your choice, which will probably be much better and less costly than if you bought one. The glue gun nozzle tips should come in different shapes, and must be exchangeable, so that it suits the specific work you’ll be doing. For common stuff, the standard sized tip will be enough. A thin tip is mainly for specific or detailed work, for example on jewelry. There are also silicon tip covers, which helps avoid burns. The temperature range over which the glue gun works is a pretty important factor you should care about. If the glue gun is reaching temperatures of 300-400 degrees, it’s called a high temperature glue gun. These are very adaptable, and can be used on almost all kinds of materials; then again, it is pretty hazardous to use something at that high temperature. The low-temperature glue guns, on the other hand, can only be used on specific things, like fabrics, paper, etc. But, these are much safer. Last, but not the least, the price of your glue gun is very important. You want to find a glue gun that is not really expensive, but serves all your purposes. These range from 10$ to even 200$. 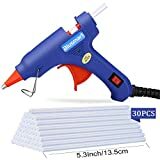 Glue guns under 10$ are simple and convenient, for occasional use, and the expensive ones are mainly used in the industrial level. If you’re looking for a complete kit, with all the glue sticks and replaceable nozzle tips, 20$-40$ would be enough. But, of course, you can always find cheap glue guns, which just serve your purpose, and good care can keep them working perfectly for a long time. One of the main reasons for the popularity of the guns, as mentioned above, is their ease of use. It’s pretty easy to use a glue gun with chances of mistakes very slim. At first, you should place the glue stick inside the glue gun, and then connect it to a power socket. The glue gun should start automatically, if it doesn’t have an on/off switch. If it does, you should turn it on. You should wait around 5 minutes, as the glue gun warms up. After that, you will take the material in front of the objects to be joined, and carefully pull the trigger, so that the glue comes out through the nozzle tip. When you think there’s just enough glue to join the objects together, you’ll remove the glue gun and turn it off. The objects should easily attach. We are going to mention some of the cool gun projects. They are fun, creative and they will boost your sense of accomplishment. If your kids are addicted to computer games or the Netflix TV series coming out every week, you can change the wind by doing these glue gun crafts with them. We hope you are already excited about getting started and find out how many of the projects you can do this weekend. If you’re using a hot glue gun, you should be careful while you use it, since the high temperatures can easily burn your skin. You can wear safety goggles and heat-resistant finger caps, so that any sputtering glue won’t affect your eyes or fingers. You should never make the mistake of leaving the switch of the glue gun on, if you’re not using it. The cords of the glue gun should also be kept neatly, so that nobody trips over. These are just simple, but important hot glue gun tips you should follow. The instruction manual that comes with the glue gun explains why you should be more cautious while using a glue gun, in a more elaborate manner. Thus, you should always read the instructions to know more of the glue gun safety tips. Sometimes, the manufacturing company also mentions any special features of the glue gun which you might not know in the instruction manual, so reading it is always worth the time. That's all for best glue guns reviews. Glue guns range from very high functioning ones, which are used in large industries, to small handy ones, used in the household. If you’re one of those professionals, then you probably already know a bit about the products listed above. On the other hand, if you are more of a hobbyist, and want to buy the one for your beautiful arts and crafting, it’s safe to say the glue guns mentioned above won’t upset you! We have enlisted the top ones out there, according to reviews from people like you, so that you can get your hands on the perfect one for yourself!